By the time mid-November in Michigan rolls around you’d think that we’ve seen the last of blooming plants until spring, that’s what I though anyway. Once again, I forgot all about our witch hazel bush that started blooming a week or so before Thanksgiving. Witch hazel is a native plant in our area. Back when I was a kid I used to see them along the edge of the woods near our house and wonder; are those spidery-looking yellow things on that bush really flowers? 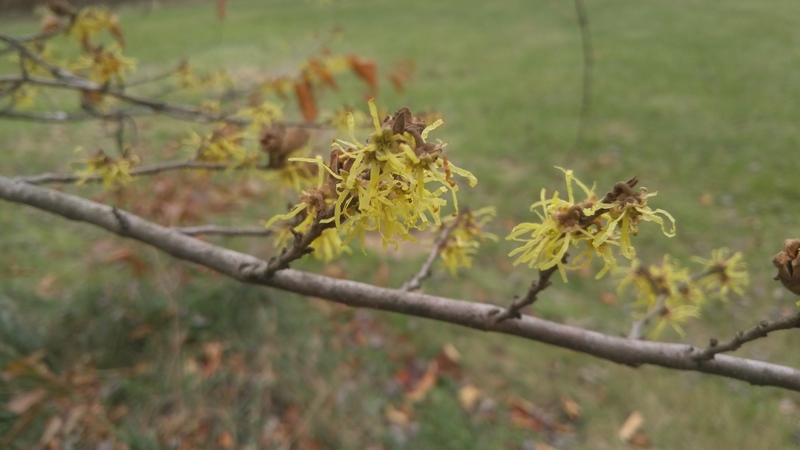 Like many other plants, witch hazel flowers are pollinated by insects, despite the fact that November is not the biggest month for insects in Michigan. With this warm November we’ve been having, there has to be a lot more insects around to pollinate the flowers. Maybe that will result in a larger than average crop of witch hazel seeds. They’re not gaudy or even very showy but witch hazel flowers are still a nice surprise in the fall. 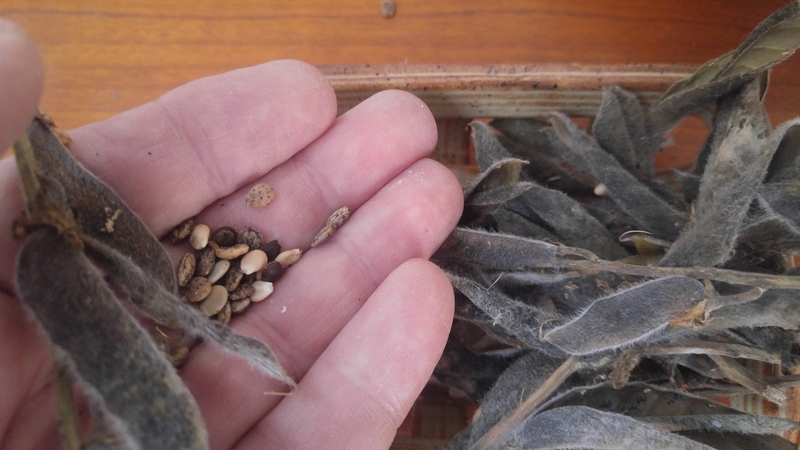 Although pollination happens this time of the year, the seeds don’t start to grow until spring. They are produced in easy-to-see, green, capsule-like structures that form where the flowers were. Later in the summer as the capsules turn brown and ripen, the seeds are explosively ejected up to 30 feet away. I’ve never had a chance to see this in person but might one of these days since our shrub is right next to the deck. Witch hazels grow very slowly, the one in our yard is about eight feet tall and has been there for almost 15 years. That can be an advantage in smaller yards since they rarely get too big for a space and out-grow their welcome. They can get up to 20 feet tall but I’ve never seen one taller than around 12 feet in our neck of the woods. Plant nurseries and garden centers sell potted witch hazel. But be aware that they often offer the imported Japanese witch hazel or Chinese witch hazel, both of which bloom in late winter rather than in the fall. One of the best things you can do for your garden is to plant winter rye; the same crop that farmers grow for flour that eventually gets made into rye bread. 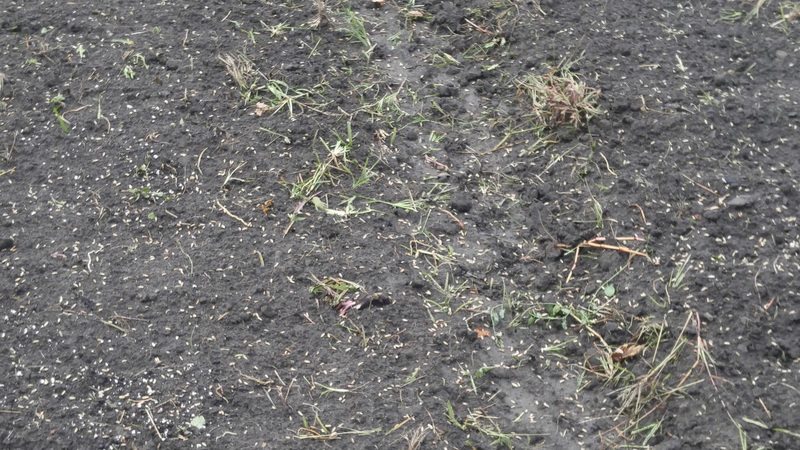 Last year at this time I wrote a couple of posts about how to sow rye. You can scroll back and find those posts if you’d like to read about it. This year I planted my rye about ten days later than usual — big mistake. Not only was it late for planting, it turned out to be the middle of the Canada goose migration. I carefully prepared the soil by removing weeds and debris. Then I mowed the finer textured plant material that was left. Next, I roto-tilled to make a nice seed bed.Broadcasting the rye with a seed/fertilizer spreader works good, which is what I did. Since my original plan was not to rake in the seed, I doubled the recommended seeding rate. With that all of that done I was sure the garden was all set for a long winter’s nap. A couple of geese had discovered all of that rye seed laying on top of the ground in my garden and decided to help themselves to a free meal. It wasn’t long before other migrating geese looked down and saw what was happening in my garden. It turned out to be a free-for-all once they landed. To a goose, the seed must look like an easy meal. By the time I checked my garden a couple of days later, it was all over. Not a seed could I find, the garden looked like it had been used as a feed lot. Goose tracks covered every square inch. They ate all 100 pounds of my rye seed in one day. I re-seeded again the next day only this time I raked in the seed and surrounded the garden with wooded stakes with twine strung between then. The twine is about a foot off of the ground and has some plastic ribbon tied to it. That seems to be enough to deter them. Canada Geese are strong, graceful flyers and are at home on the water. But on land, they’re at a disadvantage. They can waddle to move short distances but can’t run very fast or negotiate obstacles very well. Being on land makes them more vulnerable to predators than when they’re in the water or flying. That twine is just enough to to make them nervous about getting tangled up so they stay out of the garden. A few strands of twine criss-crossed inside the garden reinforces the effect. We have has a mild late-fall so my rye had enough time to germinate and get established. If not I have learned a valuable lesson about putting off planting my cover crop.